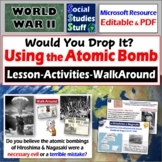 WWII: The Atomic Bombing of Japan: Necessary Measures or Calculated Actions? 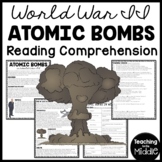 World War II & the Atomic Bomb: What Consequences Lingered? A WW2 Investigation! 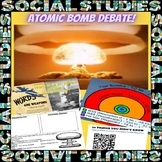 Socratic Seminar: Debate: Should the U.S. have dropped the atomic bomb on Japan? 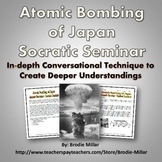 Students will learn about Germany's surrender and the splitting of Berlin. 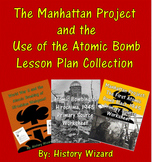 They will read about Japan's refusal to surrender, the Manhattan Project, and the Atom Bombs. 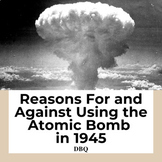 There are critical thinking questions and photos to analyze. 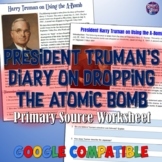 This document includes 9 primary resource documents regarding the dropping of the atomic bomb. 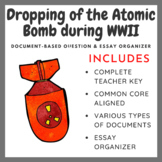 Then, students are asked to write an argumentative essay on whether the US should have dropped the bombs on Japan or not. 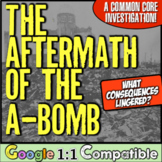 Very common core.